“What’s the one book – only one – you would recommend to help me lead people better?” That was the question a woman asked me at the conclusion of one of my training sessions recently. I hate it when the question is generic: “What is the best book you have ever read?” That’s like asking what is your favorite movie. To have just one is basically impossible. My answer to both of these questions (favorite book and favorite movie) might change day-to-day based on factors I can’t begin to fathom. But, I had an answer to her question because it was so specific. 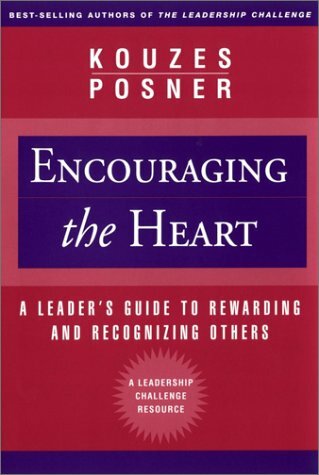 My answer was/is Encouraging the Heart: A Leaders Guide to Rewarding and Encouraging Others by James M. Koiuzes and Barry Z. Posner. This is my choice because, whatever else leadership requires, it requires actually leading real people. And people need encouragement to do their best. This book will help. I don’t know if this woman is a book reader with a stack of books always at her side or not. But, the way she asked it reminded me that for many people, their life is full enough, including the demands of their work life, that reading a stack of books is almost beyond their reach. They really do need the “one book” to help them with a specific challenge. And if they did read that one book, and put the lessons into practice, they would in fact become much better at the job they tackle. I am fully convinced that this woman will be a better leader if she reads this one book and puts what she learns into practice. Now, for people who always have a book going, there are newer books/other books/always the next good book to read. But, here is my challenge to those of you who may not have a stack of books going all the time. You’ve got six months left in 2014. Pick out one area of your work life that you just know you could get better. Google the phrase: “what is the best book on ________.” Read an Amazon review or two of the top choices, pick out the book that appeals to you, buy it, and read it—slowly. And then, put the lessons into practice. Seriously, just the act of reading a/any good book will help get you where you need to go, if you put what you read into practice! If more people read even one book carefully, and put what they learn into practice, we would see improvement all around, wouldn’t we?